Beatrice: The hen who thinks she is a pig. Beatrice is our feathered pig. She may look like a Rhode Island Red hen, but she spends all her time with her three pig sisters Millie, Charlotte, and Pumpkin and wants nothing to do with our other chickens. Beatrice was rescued from a small-scale egg farm where she likely would have spent two years producing eggs nearly daily resulting in an early death or painful life. 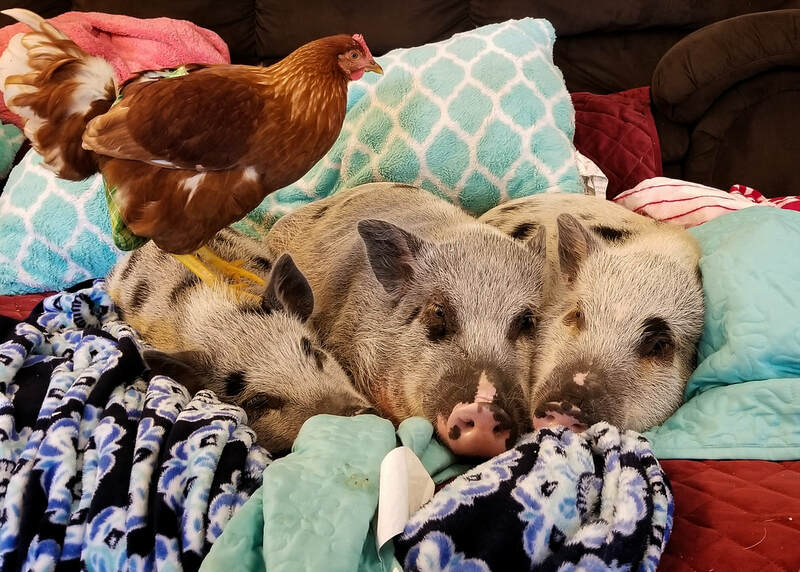 Instead, Beatrice is now implanted to prevent egg laying so that she can live a long and happy life relaxing comfortably on top of her pigs as they sleep on the couch.